will blog for food | Food. Wine & Drinks. Travel. Life. Sometimes I write about it. We’re back to sub-freezing temperatures in New York City, and with the mercury set to stay that way for the next week, a bourbon cocktail seemed appropriate. Last year, the Maple Bourbon Sour became my winter cocktail of choice. For many, maple syrup may be more of a fall flavor, but I’ve always associated it with the winter months when the trees are tapped to collect the sap and sugar houses produce the syrup. This time around, I decided to go with a fizz version using not just soda, but egg white as well. 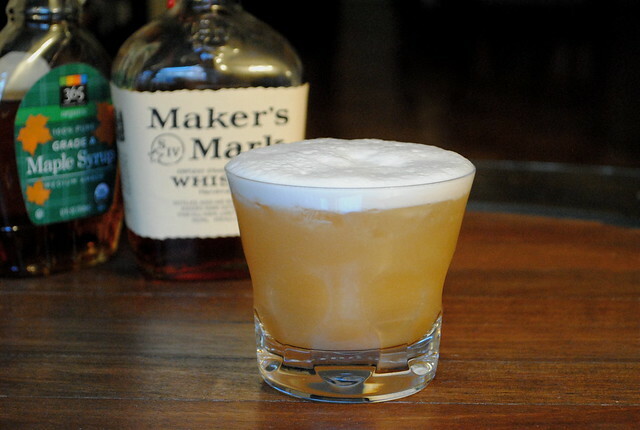 The egg white helps give the cocktail more body and a creamy texture, which melds well with the profile of the bourbon. The recipe below is the result of some tinkering on my part and reflects my personal taste. As you’ll see, there’s flexibility. For a cocktail on ice, I tend to lean heavier on the bourbon so that it doesn’t become too diluted. I’ve also found that the maple syrup flavor can get lost in the mix sometimes, so I suggest using at least one full ounce or a little more depending on your liking. And please, don’t skimp on quality with the maple syrup – use the real stuff from New England or Canada. Lemon juice is usually the standard citrus for a bourbon-based sour cocktail, but lime juice can work just as well. On using the egg white, be sure to combine and shake all ingredients before mixing with the ice and topping off with soda. This allows the egg white to fully emulsify into the frothy goodness that distinguishes this cocktail. And with an eye toward food safety, be sure the egg is fresh, at a cool refrigerator temperature, the shell is clean and, of course, your hands are clean before separating. Here’s the recipe. Happy drinking. First, fill your glassware of choice three quarters full of ice to chill the glass (the ice will also be used in a couple of steps). 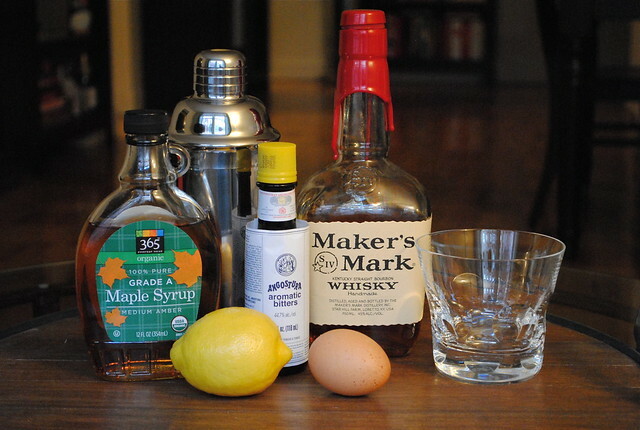 In a cocktail shaker, add the bourbon, lemon or lime juice, maple syrup, egg white and bitters. Seal and shake vigorously for 30-60 seconds. Add the ice to the shaker, seal again and give it another 10 shakes or so. Pour into the glass and top off with soda water. First post in more than two years! I certainly have some catching up to do. This post and to come will allow me to catch up on the last year of activities. As some of you may know, I recently spent eight months living Hong Kong with my wife, Maria, while she completed an eight month rotation for her job. This will be the first in a “Looking Back” series documenting our time in Asia. 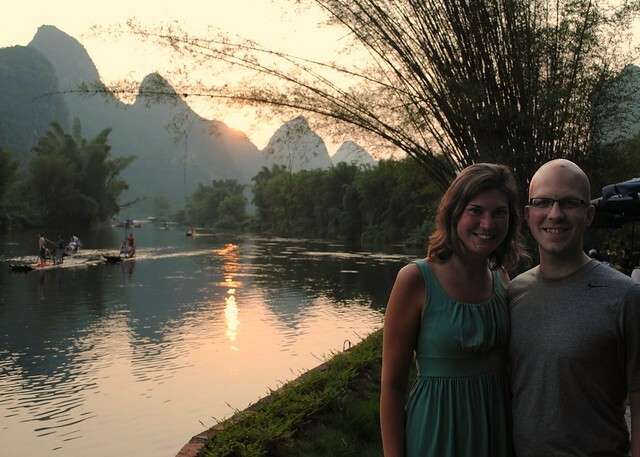 We traveled to mainland China for the first time last fall. 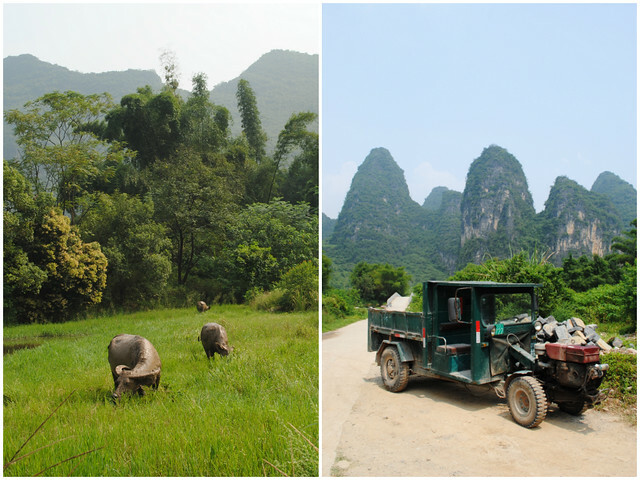 While a trip to a major city might have made the most sense for our first effort, we opted for the country side of the Guangxi province. 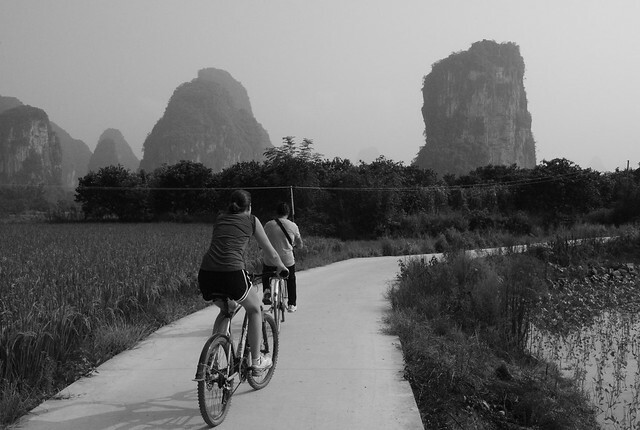 More specifically, we spent a long weekend in the Yangshuo region. 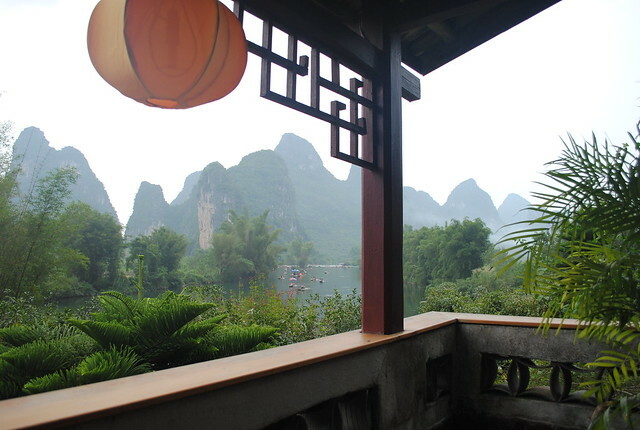 The photo above was taken from the balcony at our hotel, the Yangshuo Mountain Retreat, which is located along the Yulong River. 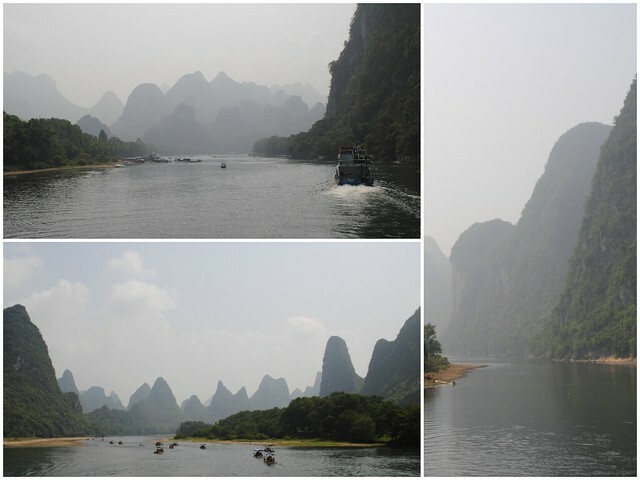 We flew into the city of Guilin and after a quick overnight, we made our way to Yangshuo via a four-hour cruise down the famous Li River. The collage and photo below include a few highlights from the trip. The scenery along the way was truly breathtaking. 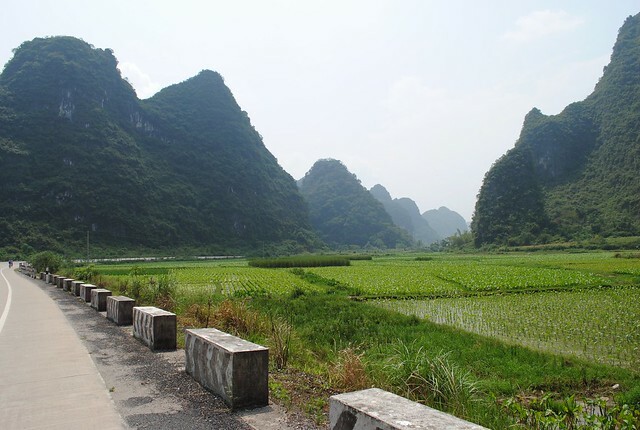 Similar to Krabi, Thailand and Halong Bay in Vietnam, this region is marked by countless karst formations. When you’re floating down the river, the formations seem to go on forever. 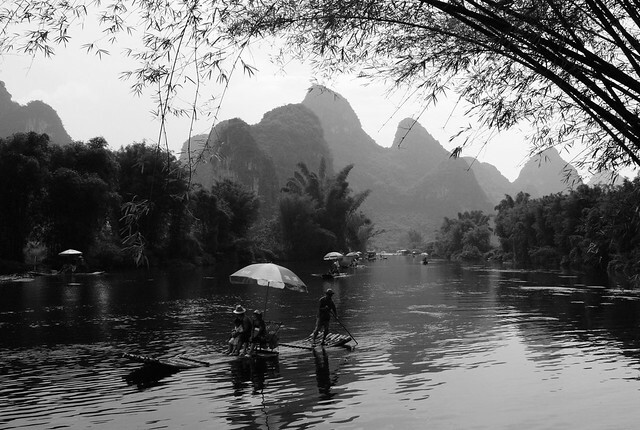 The above photo highlights a famous scene along the river, the image of which is featured on the backside of the Chinese $20 bill (the front side features Mao, of course). 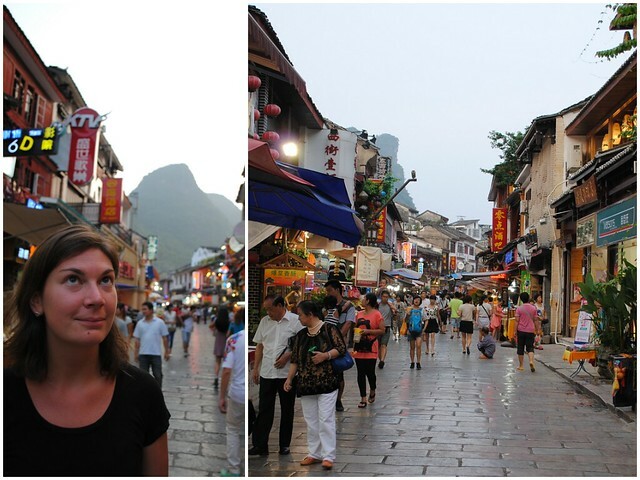 The photo above features West Street (and Maria) in downtown Yangshuo. This area was mainly geared toward the tourist crowd, with typical “Asian” cuisine restaurants, Western bars and markets to buy cheap trinkets and gifts. We only spent the first evening in town and instead opted to spend most of our time in the countryside. You’ll see why below. 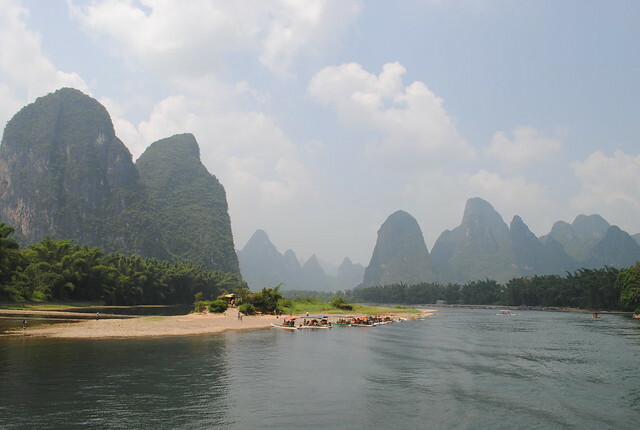 The photo above features the the riverside view of the Yulong River in front of our hotel. Not a bad place to spend a few days. 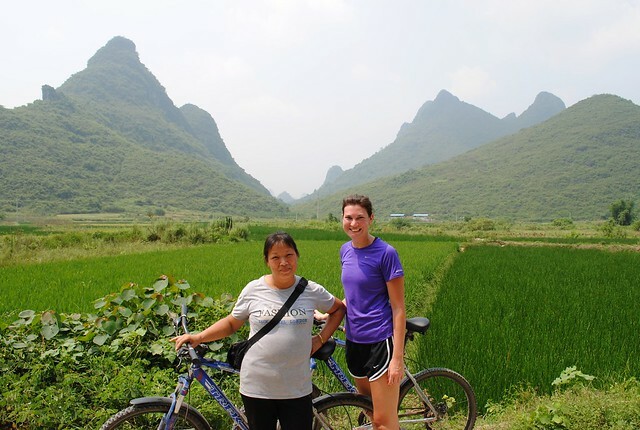 For our first full day in Yangshuo, we went for a guided biking tour of the countryside. It was pushing 90+ degrees and we rode for nearly 20 miles, but it was worth it. 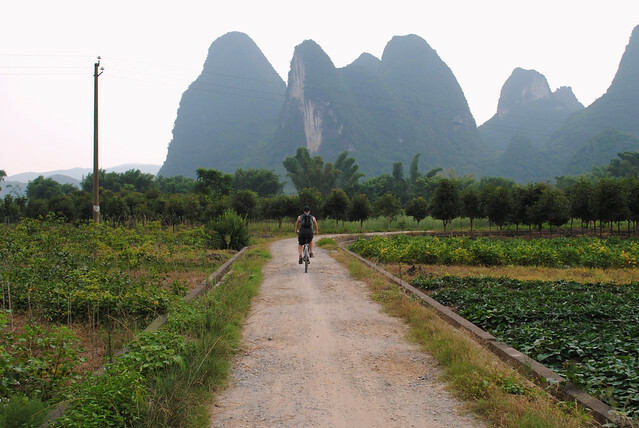 The scenery is spectacular and traveling by bike was a perfect way to get up close and personal with the region. I’ve included a few highlights in the photos below, along with a few quick descriptions. The first photo was taking shortly after we started out on our journey. 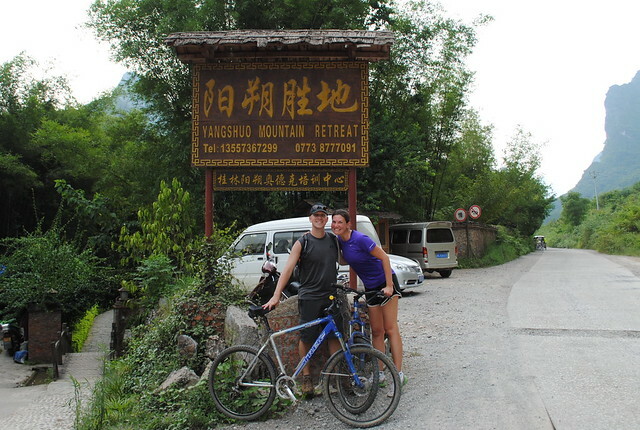 While we traveled on a variety of roads and dirt paths, there was also a nice network of paved trails. Above you see a few of the many water buffalo throughout the area and a cool looking old truck. Below is a photo of Maria with our guide. Note that we were sweating bullets all day and our guide didn’t seem to sweat a single drop! 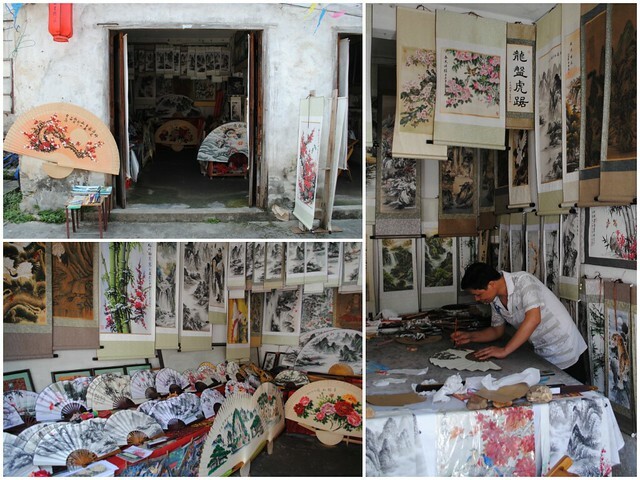 The collage above highlights the small village of Fuli, which is famous for being home to several artisans that paint classic images of the Yangshuo region on fans, screens and scrolls. We bought a scroll painting from the gentleman in the photo. 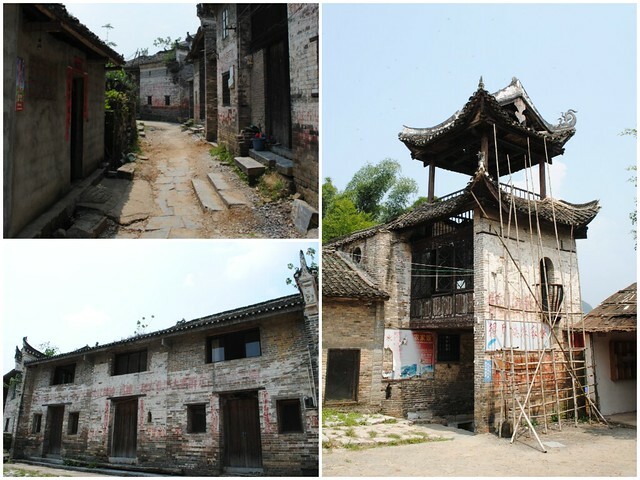 I don’t recall the name of the village in the collage above, but it was located along the Li River and featured several older buildings. The photo below was taken from a highway as we were winding our way through the karsts. It was one of the most scenic moments of the day. Shortly after taking that photo, we stopped for lunch at a restaurant just below the famous Moon Hill. We also visited a cave with mud pools and fake “natural” hot springs in the afternoon, but the photos for those two spots didn’t make the cut for this post. The next photo features a path along the home stretch as we made our way back to the hotel. And here we are at the end of our trip – exhausted and hungry, but it was well worth the effort. We spent our last evening dining outside along the river and catching another fantastic sunset. 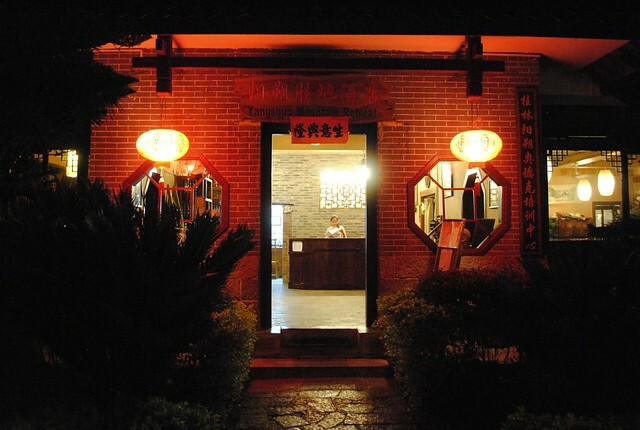 And to wrap-up the post, the last photo features a China red evening view of the entrance to the hotel. Many thanks to Chris, June and Crystal & Karl for the travel tips. Up next will be a few posts on living in Hong Kong and travels in Japan and New Zealand. For any visitors to this site recently, or in the last year and a half, you’ve surely noticed a glaring lack of activity. Life gets busy sometimes and for me that meant a greater focus on my job, planning a wedding and getting married, leaving previously mentioned job, and moving to Hong Kong after spending nearly 15 years in DC. While I haven’t been completely absent online – see my Twitter and Instagram accounts – blogging has not been a top priority. In the coming weeks and months, I’m planning to establish a new focus that will allow me to continue the site in a meaningful way. Stay tuned. So instead of rehashing all of the suggestions and tips, I’m just going to keep it simple. Here are the links to last year’s posts: Critics’ Tips and My Tips. And below you’ll find two of the wines that I’m bringing to this year’s Thanksgiving dinner. 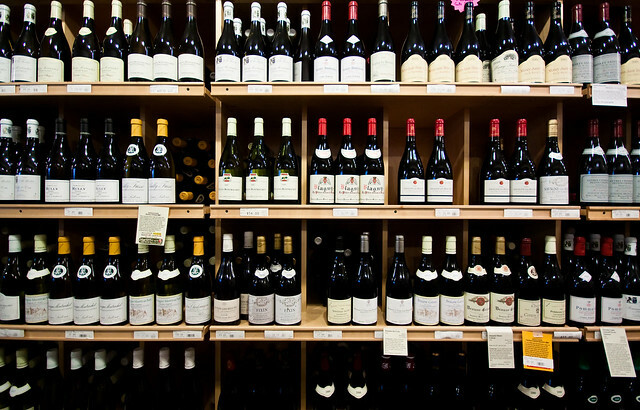 But first, here’s the MOST important tip that you’ll ever need – make sure you buy enough wine! Today is Food Day, so I thought I’d post a few things. First, if you haven’t heard of Food Day, check it out. Luckily for me, my job allows me to work on food issues full-time. Right now I’m working to improve U.S. food and farm policy (i.e., the “Farm Bill”) by expanding local and regional food systems. Back in August, one of my colleagues at UCS put out a great report, “Market Forces,” on the economic benefits of local and regional food. Since then we’ve been working on legislation to bolster federal support for local agriculture, which is going be introduced within the next week by Congresswoman Chellie Pingree (from the great state of Maine!) and Senator Sherrod Brown. You can read more about it in this press release from Congresswoman Pingree. So to celebrate Food Day, you should click on this action alert from UCS and tell your members of Congress to support this legislation. Lastly, take a look at this excellent video from Chipotle (featuring a great Willie Nelson cover of one of my favorite Cold Play songs). It pretty much sums up what my day job is all about.